Spider® Shelving by Rousseau is designed for intensive use. Easy to install and with a wide range of configurations and accessories available, they are the ideal solution to meet your company's storage challenges. 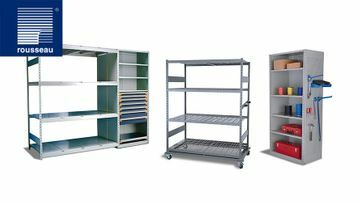 From shelving and mini-racking, to drawers in shelving and mezzanines, complete systems to maximize organization and improve productivity. 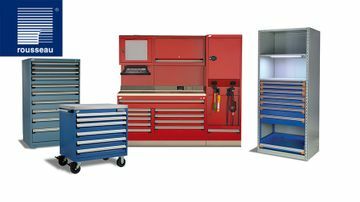 Workbenches and workstation systems have been designed to make your workspace functional and organized. Because they are modular, they come in a variety of configurations to meet the needs of your company and employees. There are multiple options to choose from, including stationary or mobile workstations and with or without a frame over the work surface. Choose Rousseau products for your company and benefit from their reputation for quality. 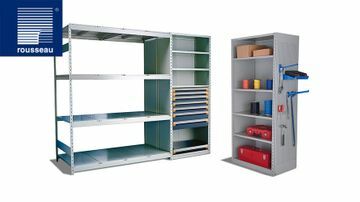 These cabinets are heavy duty and provide many possibilities for safe, secure and efficient small parts storage. Rousseau drawers have industry-leading durability and the sliding system comes with a lifetime warranty. By choosing Rousseau, you are opting for the most reliable and highest quality products on the market. AIMS is the sole distributor of Rousseau products in Newfoundland and Labrador.